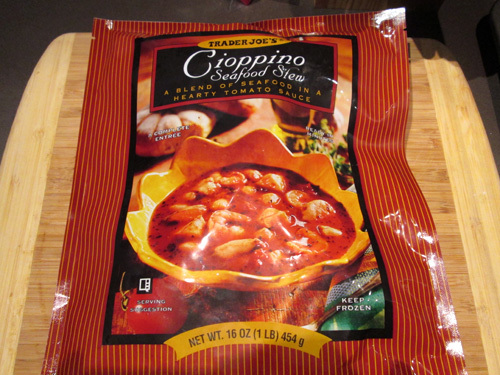 I’d been eyeing this seafood stew for a while, but hadn’t gotten around to trying it due to the $5.99 price tag. The bag says this should be good for 2 servings, but given that it’s only 170 calories in each serving, that would be an incredibly small meal if you were eating it by itself. Unfortunately those 170 calories contain 80% of your daily sodium intake, but I didn’t realize this until AFTER eating the whole bag at once. But onto how this tastes. 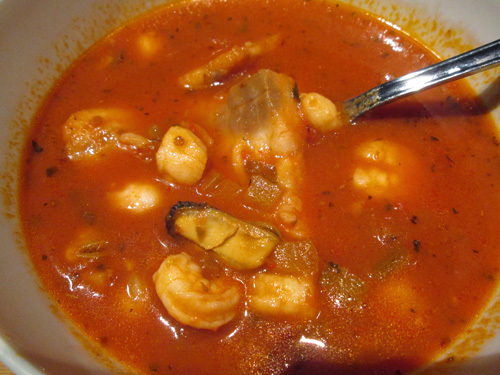 This stew is a mix of mussels, cod, shrimp, and scallops in a tangy tomato sauce with a good dose of garlic. I was actually shocked at how good it was. I’d expected I’d probably like it, but nowhere near as much as I actually did. The only thing missing was a piece of garlic bread to go with it. Even though I hate winter, this stew was so good I’m actually looking forward to coming home on a cold winter day and heating up a bowl of this for dinner. The bag of seafood is all raw, so you have to cook it up when you’re making it, but it’s pretty easy. I’d recommend adding the larger pieces of fish first though, and then adding everything else two or three minutes later so your shrimp and scallops don’t come out rubbery.